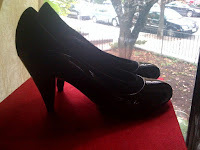 I bought the most precious pair of black patent leather pumps today. Click clock down the sidewalk they go. They have excellent trampling and cbt potential, but for tonight, they make their debut at a posh Boston restaurant. There's something about the gleam of patent leather that inspires confidence. It also reminds me of those little maryjanes I ritually wore to church as a little girl - set off by frilly white lace socks, of course. I think I'll skip the socks this time around.